I wanted to show you all a before and after look at Crystal Beach, TX which is near Galveston. It was on the very strong 'east' side of the eyewall of Hurricane Ike. This before picture shows a beautiful beachfront community. 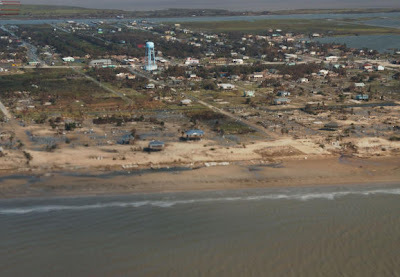 The after picture below shows a community that was decimated by wind and water. The big damage came from the water which swept homes away. 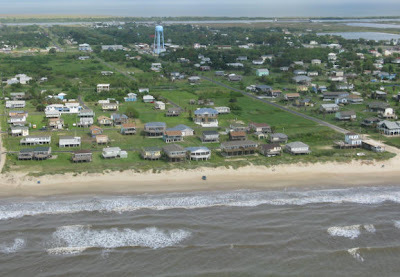 This community, along with Gilchrist, Texas on the Bolivar Peninsula took a relentless beating during Ike. I understand that recovery operations are continuing. As one of the Weather Channel anchors said the other day, there is a reason they are called "barrier islands." They take the brunt of a storm, helping to protect the mainland. It's a beautiful location but not meant for building houses. You're right, they provide a 'barrier' to the mainland. Definitely isn't conducive to getting tattooed by a big hurricane. KHOU-TV talked on the phone to a lady I think was from Crystal Beach who was determined to remain. She was expressing her faith and trust in God. When you have the notice that is available thanks to the GOD-GIVEN human skills and technology today, why not heed the warnings GOD is giving to evacuate!!! I've been wondering if she made it. She was a sincere, sweet sounding lady.